19/01/2017: After a busy few days in New York, we were all in need of some serious sleep, so, we started our day a little later than usual and convened as group in the hotel lobby at 11am - a far cry from our usual 7am starts. After a brief discussion in the hotel lobby, we decided to head to one of America’s most beloved and iconic culinary attractions, Shake Shack, to have burgers for breakfast (sorry, mum). After indulging in some American cuisine, we took a short walk down to a local grocery store and grabbed some snacks for the next couple of days as we have a busy schedule ahead. We met back at the hotel and changed into our formal wear ready for the first day of the Yale Model United Nations (YMUN)! The YMUN began in Yale’s breathtaking Woolsey Hall, which was built in 1901 and features one of the world’s largest and most renowned pipe organs which provided a mesmerising and spectacular backdrop (see image below). After a brief information session about Yale and what their institution can offer alumni, the students went to new delegate training where they discussed the procedures of a Yale model UN, brushed up on their debating skills, and were given an overview of the days to come. 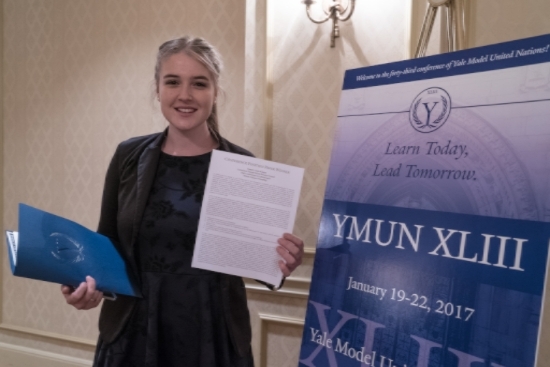 Following the training, YMUN was officially launched with an opening ceremony; students were invited to listen to Yale students as they spoke about their journey with Yale and the value it’s afforded them beyond an education. Immediately after the ceremony, the students were sent to their committee groups to begin debating, which, according to all reports, was an invaluable experience! The first day of debating finished up at 11.30pm and because it was also one of our students, Yash’s, birthday, we decided to surprise him with a cake and sang him happy birthday in the hotel lobby at midnight. While the day was filled with many highlights, the most impressive moment was when Alena, one of the members from our group, was awarded the best position paper for the entire conference of around 1600 students! Congratulations to Alena and all the Crimson Yale Model UN participants on a great first day of debating.